At merely 17 years of age, Vince creates Danish music history when he forms the first Danish rockabilly band, The Jime. Having seen the Stray Cats on TV in London, he decides during a math class in high school to form his own rockabilly band. I got an uncontrollable urge to play rockabilly after hearing The Stray Cats. I also got an uncontrollable urge to leave High School (!). After 10 minutes of brainstorming, he comes up with a name for his band: “The Jime”. It had to stand out from other rockabilly bands which were all called something with “Cats”. I just made up the name and couldn’t find it in the dictionary so I didn’t think it meant anything. As it later turned out it means “Strangulation” (!) in Judo and “Jazz Improvisation Made Easy”. It’s also a Japanese way of killing a fish with a speer through it’s brain!…makes extra fine Sushi!!! Vince starts looking for musicians for his band. His child friend, Rudi, becomes the band’s first drummer. In an ad in the Danish MM Music Magazine, Vince Gordon announces his search for a bass guitarist to play slapbase in his newly formed rockabilly band. Vince gets a little room in the basement, where he can practice. He calls it “Graceland”. 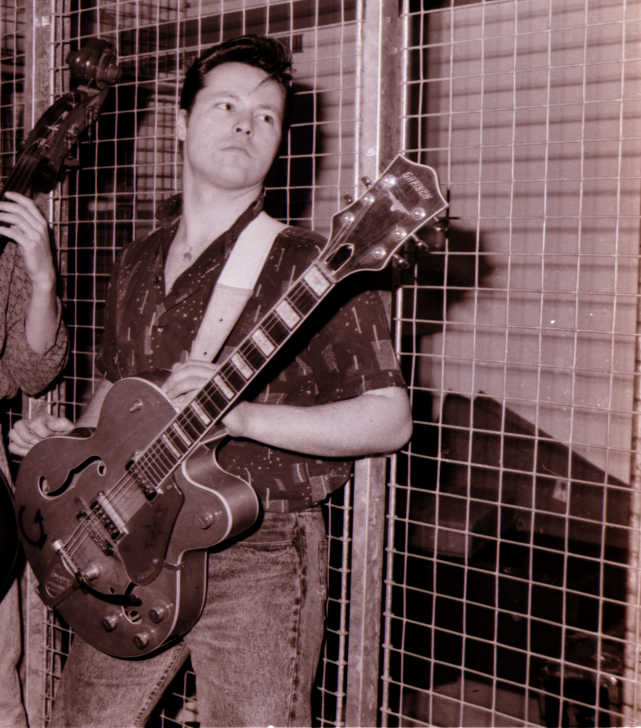 I can hardly describe how unusual and offbeat the idea of a Danish rockabilly band was at the time. I talked briefly with Lasse (Vince) on the phone, and while he admitted that he was inexperienced, he had ambitions. I went out to visit him in Hørning, where he had a little room in his parents’ house, with an Vox ac30 amp, a standup piano and a three vintage Gretsch Guitars. Vince called the room “Graceland”, an example of his dry Danish humor. Lasse (Vince) looked the part with a slicked back 50’s-style hairdo and a Hawaiian shirt. He was not the accomplished guitarist that he later became, but he had already written some rockabilly songs of his own, plus a number of novelty songs, which showed the Monty Python inspired humor that we both shared. His energy and determination in constantly upgrading his skills as a songwriter and lead guitarist was a force of nature. 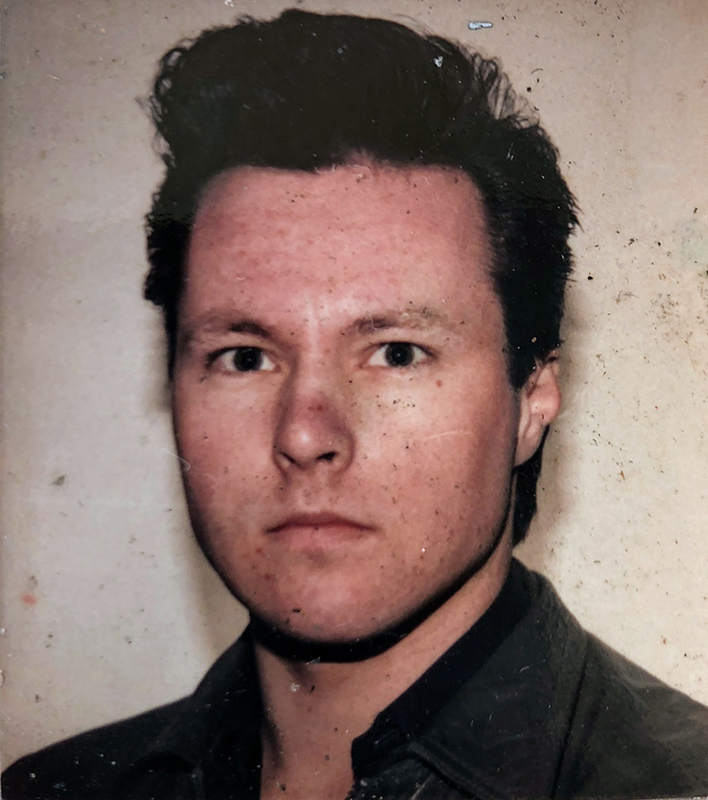 Though I already had been playing gigs as a lead guitarist in a dance band, I had a feeling that this was something original and unusual that I wanted to be part of, so I chose to play the electric bass behind Lasse in the first two versions of The Jime”. A standup bass player who knew, and was interested in playing the slap bass style, was still years away in Denmark. 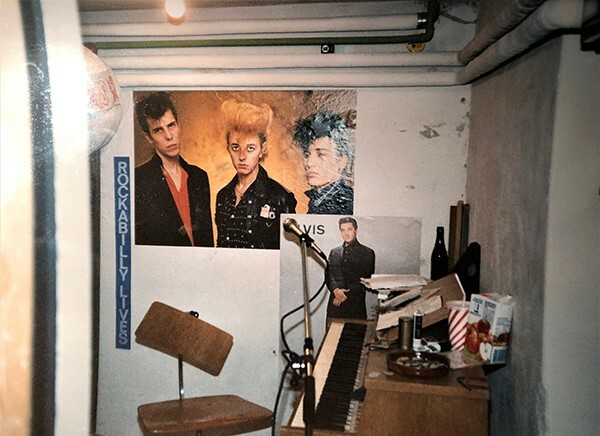 Vince’s goal was, from the start, to make an album of original rockabilly material that would inspire others in the same way the Stray Cats’ first albums inspired him. A goal he would reach years later.